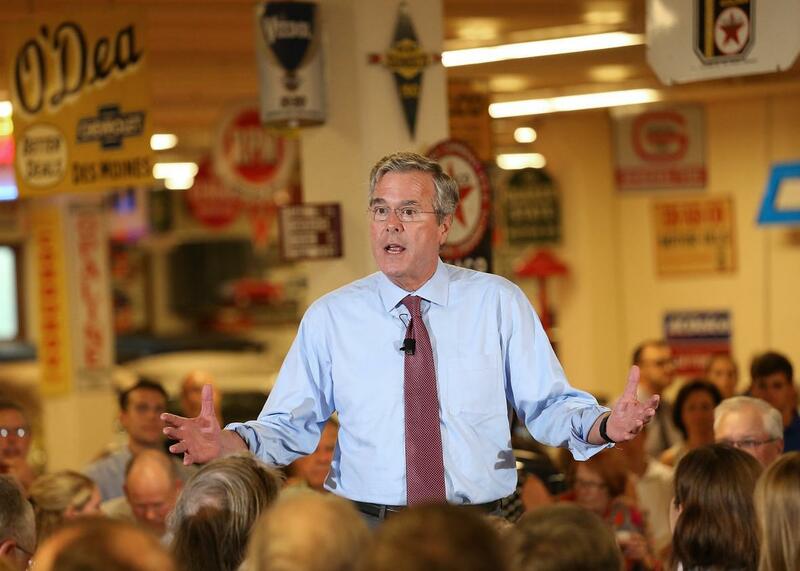 Jeb Bush's identify crisis on display in Oskaloosa, Iowa. Jeb Bush speaks at Dennis Albaugh’s Classic Car Barn during the Polk County GOP Annual Summer Sizzle event August 13, 2015 in Ankeny, Iowa. OSKALOOSA, Iowa—Tired of fighting against the anti-establishment headwinds that have battered his campaign, Jeb Bush this week began to see if he could sail with them at his back. This, to put it mildly, will be a difficult needle for Bush to thread. Even if voters are willing to suspend their disbelief that a modern-day political scion can be an outsider who will strike fear into the political establishment, Wednesday’s performance made it clear that they’ll also have to ignore a whole host of contradictions inherent in Jeb’s rebranding effort. The one-time GOP front-runner opened by telling the crowd that when he was governor, he was above party politics: “It didn’t matter if you had an R by your name or a D by your name,” he said. Before he was done, though, he was decrying the “progressive liberal agenda” that he said was being pushed by Democrats in Washington. His attacks on the status quo, meanwhile, came with the necessary digs at lobbyists and special interest groups, but later while trying to prove his gun-rights bona fides to a questioner, Bush was quick to tout an award he won from the National Rifle Association—which, by almost any definition, is a lobby that holds outsize sway in Washington. Similarly, Bush continued to try to have it both ways when it came to the intra-party attacks that have come to define a GOP race that has been shaped by the blustery belligerence of Donald Trump. He lamented the sniping that was going on on the trail, but later took his turn subtweeting his rivals. “I don’t believe the people who talk about it, who sit on the back bench and talk about things all the time and go on the talk shows, are necessarily the ones who can do it,” he said in a not-so-veiled shot at less politically experienced candidates like Trump, Marco Rubio, and Ted Cruz. It’s hard not to see panic in Bush’s attempts to have it both ways. His donors have made it clear that they are losing patience with his middling performance on the campaign trail, and he knows he must do something to right the ship, and soon. His problem, though, is that by trying to be two very different things—establishment favorite and anti-Washington crusader—to two very different groups of people, he risks becoming a candidate who is nothing to either.